Pros: As good or better performance in general than the $100 more expensive Mac 6800 Ultra card. Single slot design. ADC and dual link DVI port. Support for HDTVs via DVI Port. Control Panel w/advanced features including 3D/GL overrides. Reviewer's Tilt: (Jan 2005) If I were buying a high end card for my AGP slot G5 Mac today, personally I'd choose the X800 XT over the 6800GT or the more expensive 6800 Ultra. Considering the performance, single slot design, ATI control panel features (nothing like that for Mac nvidia cards) and (generally) more frequent Mac driver updates than the Nvidia cards, I consider the X800 XT a better overall value for most users than the Mac 6800 series. Requirements: Apple PowerMac G5 Tower system running 10.3.5 or later per user guide (specs page notes 10.3.6 or later). 512MB RAM or better. 8x AGP slot required, so not compatible with G4 Towers. Retail package includes one DVI to VGA adapter, ATI software CD and Installation/User guide. 3-year limited warranty. Availability: The X800 XT Mac Edition originally shipped in January 2005 at $499, later dropped appx $200 (in 2007) but after a brief appearance in late Sept/Early Oct. 2007, it's not longer listed at the ATI online store and likely is EOL (end of life) due to parts availability. As of early Oct. 2007, Site sponsor OWC has some of the last stock on the xlr8yourmac specials page but may be sold out by the time you read this. 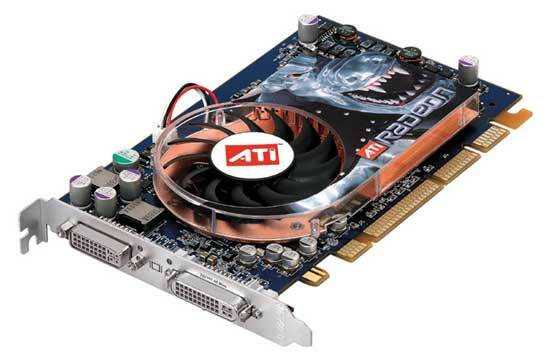 On Jan. 5th, ATI officially announced the Radeon X800 XT Mac Edition graphics card for PowerMac G5s. The Mac X800 XT has one Dual Link DVI and one ADC port and supports the Apple 30-inch Cinema HD Display as well as legacy Apple ADC Displays and (with included adapter) VGA monitors. The X800 XT features 16 pixel pipelines, six vertex pipelines and 256MB of GDDR3 memory. (2005) Original list price is $499 ($100 less than the Mac Nvidia 6800 Ultra, although that card can drive two 30in displays). Since 99.9% of Mac users won't own two 30in Cinema displays, I think the choice of Dual Link DVI + ADC port makes market sense and it's -very rare- to see a retail card with an ADC port. Although I have never been a big fan of ADC (powering a monitor from the computer P.S. ), there are a lot of those displays out there and having a native ADC port saves having to buy a $100 or so DVI/ADC adapter w/Pwr Supply. Here's a photo of the X800 XT Mac Edition (courtesy ATI). 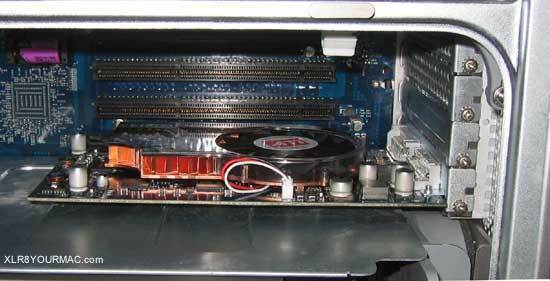 Here's a photo of the X800 XT card installed in the test system (2003 model Dual 2GHz G5). This is always a common question from readers. My review sample X800 XT arrived without any docs or CD and after installing the card initially, I was surprised at the fan noise level as it was clearly louder than the 6800 Ultra sample I had used. I immediately mentioned this to ATI and was told I was the only person that had complained about fan noise. A day later after writing for a version of the ATI Displays that recognized the X800, I was sent an installer that included a ROM Xtender file. After installing that I noticed some new resolutions but also noticed that the fan wasn't running at WFO anymore in typical use. I noticed at cold start the fan noise/speed was high, but then dropped after the OS loaded. I wrote ATI to confirm my quess that the ROM Xtender enabled fan speed control on the card - they replied it did. More info at Nvidia's Geforce6 tech specs page. 2D Image Quality/Performance: 2D image quality, resolutions/refresh rates, DVD playback, Apple Motion RAM Preview, Appleworks 6.2.9 scrolling, XBench (graphics/UI), and Let1KWindowsbloom tests. Game Performance: Halo, Splinter Cell, Call of Duty, Unreal Tournament 2004, Return to Castle Wolfenstein and Quake 3 tests. Details of the test system used for this review is listed below. or use the links below to jump to a specific page.